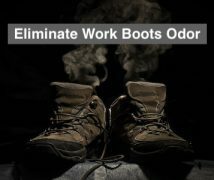 Do you want to quickly break-in your work boots? We’ve all been in that pandemonium of buying footwear that doesn’t quite fit, although they’re the right size. And buying a bigger size would only mean ending up in two weeks with a pair of shoes that are too wide. 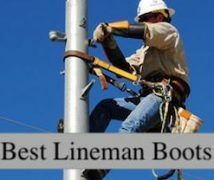 But things are particularly irksome when talking about work boots, which should be comfortable and durable enough to wear them even 50-60 hours each week. That’s why you need to know how to break in your work boots. Since we’re talking about this sort of boots, you should know that it’s not unusual to feel some degree of discomfort at first, especially in your heel or toe areas. That’s particularly common with steel toe cap work boots, that have a rather narrow toe box. Still, you want your boots relatively comfortable, so you should never have to deal with foot injuries. But how do you do that? Well, you need to break them in slowly instead of wearing them for 12 hours straight right out of the box, after preparing them thoroughly. That way, you’ll avoid blisters, injuries and you’ll say bye to stiff boots. Sounds like a dream? It’s not if you read the article below. There are various ways to break in footwear, and the most common one of all is to start wearing them around the house or around the block in increasing amounts of time. However, that can also give you quite a lot of blisters or aches, which can become worse over time. So the solution is to make sure your boots are ready for wearing before putting them on, and that can be done in a variety of ways. Try on your boots and see where they feel too tight or stiff. Get a stick that’s roughly 2 inches in diameter, maybe that of a mop or a broom. Place one end of the stick inside your boot, in the area that feels uncomfortable. With gentle movements, flex the boot over the stick to allow the upper to stretch. If you have leather uppers, you’ll see they become a lighter shade in the stretched area, which is normal. Repeat this until you feel better wearing the boots. Make sure your work boots are waterproof, or waterproof them yourself first. Get a bucket and fill it halfway with lukewarm water. Get your boots and place them in the bucket for half an hour. If the uppers are manufactured from finished leather, let the boots relax in the bucket for an hour. When that’s done, get rid of the water inside your boots. Grab a pair of comfy socks and take your boots out for an hour’s walk. Allow the boots to dry before taking them for another test walk. Try on your boots to understand where they feel stiff or tight. Get a couple of Ziploc bags and fill them with water. Make sure you get all the air out of them and seal them tight. Put the bags inside your boots, aiming at the area where you feel the discomfort. Make sure your freezer is empty enough, and place the boots inside. Let them sit at least 8 hours or overnight, so the water can expand and stretch the boots from inside. In the morning, get the boots out of the freezer. Don’t remove the water packs until all the ice has melted. Try your boots to see where they feel uncomfortable. Apply a thick coating of oil on the outside part of the boots that feels uncomfortable. Let the boots rest for at least 8 hours or overnight. Once enough time has passed, grab a clean cloth and wipe away the extra coating. Try your boots on again and check how they feel. Now that you’re here, you’ve learned four different methods to make sure your boots are broken in. These work way better than the traditional wearing of the boots for increasing amounts of time, that can take as long as a month, with all the extras on top, like corns and blisters. Take into account the fact that your boots will need a reasonable amount of breaking time, which is about two weeks. So when you buy work boots, consider this breaking in period too. Size matters, so get boots that fit you well, to begin with. 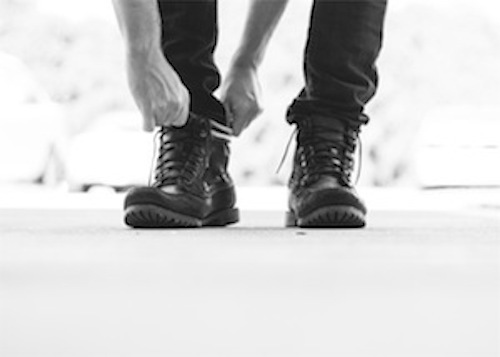 If your job involves you spending a lot of time on your feet, make sure you get a really comfortable pair of boots, checking that the midsoles, insoles, and footbed provide the right amount of cushioning. Don’t try to break the boots at once, by wearing them in bursts of 2-3 hours right out of the box. Rather walk around your house and start with 10 minutes per day. Take your boots to work after the first week of breaking in, so you can analyze the way they feel right on your turf. Don’t start with a full shift, though. Don’t begin the breaking in period if you already have feet problems like blisters, corns or ingrown nails. When you put on the boots for the first time, pay attention to every pinch, ache or hotspotyou might feel. If you feel pain with the boots, you should consider using your warranty and replace them with ones that are a half size bigger. Apply leather conditioner every day during your breaking-in period, before taking them out on that sweet test walk. Never apply direct heat on your boots because it will dry the uppers. So ignore the myth of you baking the boots in an oven because you might crack their leather uppers. When breaking in a pair of steel-toe work boots, put on your most comfortable, cushiony socks. These offers increased protection to your toes during the breaking in phase, but they also keep your feet warm. Try to make the soles as flexible as you can, so bend the boots a few times each way before putting them on. Add an insole for the boots after the first few days if you still don’t feel the breaking-in starting to actually break in. For steel boots, we recommend orthopedic insoles thanks to theirergonomic shape. 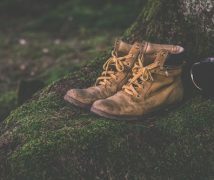 Place moleskin on your feet where you feel some discomfort or tightness after putting your boots on, like maybe on your heels and toes. Breaking in footwear is a lengthy process, and it’s understandable why you might want to speed things up. But don’t. Seriously, don’t. Delayed gratification isn’t just a fancy way to stop you from seeing fast progress, it can actually save your feet from all sorts of aches and pains. Just remember to treat your boots right and spend some time every day with them, like you would with a trusted friend. After all, that’s what they’ll become soon: your best friends. That said, we’re curious to hear more from you. What’s your line of work? What boots do you have? Have you tried breaking in your boots before? What worked? What didn’t? What did we miss in this article? Leave us your comment below!